Hustings at Clare College. 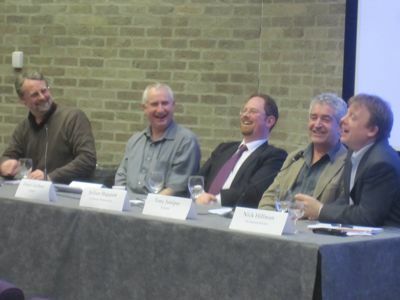 Left to right: Martin Booth, Cambridge Socialists; Daniel Zeichner, Labour; Julian Huppert, Liberal Democrats; Tony Juniper, Green Party; Nick Hillman, Conservatives. In Cambridge we are lucky that there are a large number of hustings events at which it is possible to hear from our parliamentary candidates in person. The below upcoming events are all free and open to all. Do let me know in the comments if there are others which I have missed. Election Question Time run by Cambridge No2ID, Amnesty International Cambridge and Cambridge Oxfam Group. Chaired by Andie Harper of BBC Radio Cambridgeshire in the chair. Open to all, and free (but donations are appreciated). What kind of Britain? – Visions of a sustainable economy. Organised by Transition Cambridge and the University of Cambridge Geography Department. Democracy Club and Power2010 Parliamentary Hustings. A BBC Radio Cambridgeshire debate with the Cambridge Candidates will be recorded on Tuesday 4 May from 6.30pm-7.30pm in front of a live audience. Andie Harper will host the debate and it will be broadcast on the Mid-Morning Show on Wednesday 5 May from 10am-11am. While I am not aware of any hustings events for the local election there is a full council meeting in the Guildhall at 18.00 on Thursday the 22nd of April this is a public meeting at which sitting councillors will debate. Members of the public (including candidates) may address the meeting during the public speaking section. There is also a North Area Committee on Thursday the 29th of April at which sitting councillors can be observed in action, and I expect questions from the floor during the “open forum” will be lively. Tuition Fees – General Election Spring 2010 – Includes video from Clare College hustings. Opening statements from Conservative Nick Hillman, Liberal Democrat Julian Huppert, Green Tony Juniper and Labour’s Daniel Zeichner at a hustings in B-Bar in February 2010.
http://www.julianhuppert.org.uk/content/upcoming-events-cambridge (which has only just gone up) also lists one on 30 April. btw you might want to swap the order of Sun 25th and Thurs 29th in your list. Thanks Phil, I’ve updated my list. The list I put up on the Daniel Zeichner website also has a hustings on the 28th at Emmanuel UR Church at 8pm and a debate at 11am on the 30th at Anglia Ruskin. I presume if those aren’t on Huppert’s website then he won’t be attending those ones in person? The Emmanuel UR Church one is listed as being on the 22nd (i.e. this Thursday) both on Julian’s list, and on Richard’s original list above, but as the 28th on the Zeichner list. Are there two separate events, or has someone got the date wrong? I don’t know if he’s going to the Anglia Ruskin one – is it open to the general public? I think the list on Julian’s website only includes public events. Thanks for these, Richard, I will try to make some of these. The candidates must be exhausted! I’ve added the Transition Towns / University of Cambridge Geography Department event at the Emmanuel United Reformed Church the 28th. Thanks for the promotion, Richard. I’ve noted the BBC Radio Cambridgeshire debate on the list. Thanks for this Richard. It is very useful. I have had various requests for a list and it is good to have one on a non-partisan site as well as on our own sites. See also the links under “previous hustings” above.